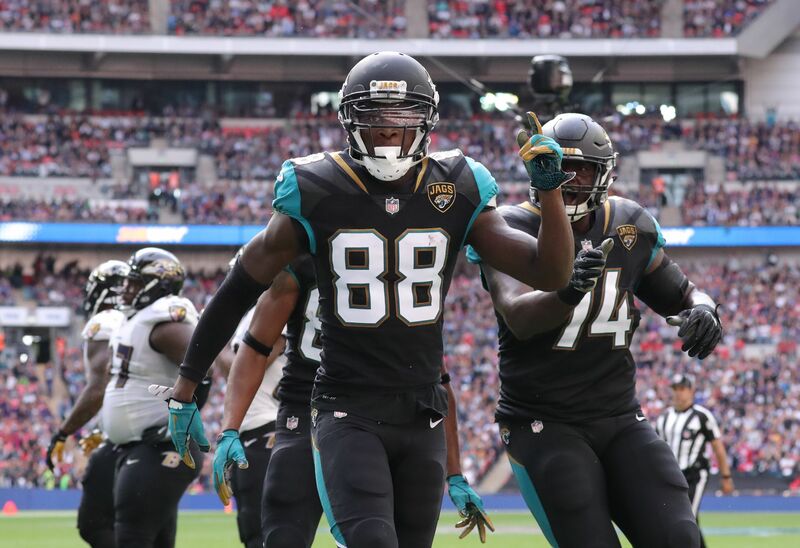 The Jacksonville Jaguars obliterated the Baltimore Ravens 44-7 in Week 3 in London. Here are all the highlights, the recap and the final score. London’s favorite NFL team showed up in a big way at Wembley Stadium on Sunday in Week 3. The Jacksonville Jaguars demolished the Baltimore Ravens to the tune of 44-7 in the first NFL in London game of 2017. Jacksonville has played in London annually every year and this sort of familiarity with playing overseas is starting to be a real advantage for this team. Baltimore sleepwalked through the entire game and it was an embarrassing effort for the Ravens. The Jaguars defense came out and punch the Ravens in the mouth, forcing three costly turnovers. Baltimore could not move the football at all on the Jaguars defense. That unit is becoming a top-tier defense in football. It has allowed the Jaguars offense to flourish in the early part of the season. This might have been Blake Bortles’ best game as a professional. He played with tremendous poise and looked to throw the football down the field the entire game. His favorite target was none other than veteran blocking tight end Marcedes Lewis. It was a tremendous mismatch for the Jaguars to exploit, as the Ravens had no answer in defending the tight end position all game. Though the Jaguars destroyed the Houston Texans at NRG Stadium in Week 1 with a 10-sack performance, many overlooked the game as a one-off for the Jaguars. They did stumble a bit at home versus the division rival Tennessee Titans. However, slaughtering the Ravens in London this badly has to have us re-evaluate the status of both clubs going forward. Jacksonville looks to be a team that can hover around .500. If the defense holds, up the Jaguars can challenge the Titans in the AFC South this season. As for the Ravens, it seems that their two wins over the Cincinnati Bengals and Cleveland Browns mean close to nothing. Those might be two of the worst four teams in football. Many thought Jacksonville would be terrible this year, but that does not seem to be the case any more. It was essentially over from the first series of the game. Baltimore was outclassed in this game. Jacksonville has to feel great at 2-1 heading into a winnable Week 4 game in New York. Marcedes Lewis: Lewis had four catches for 62 yards and three touchdowns. Blake Bortles: Bortles completed 20 of 31 passes for 244 yards, four touchdowns and no interceptions. He averaged 7.9 yards per attempt and had a quarterback rating of 128.2. Telvin Smith: Smith had seven tackles, all solo and a big fumble recovery for the Jaguars. The Ravens will face their toughest AFC North rival at home on Sunday in Week 5. Baltimore will take on the Pittsburgh Steelers on October 1. Kickoff from M&T Bank Stadium in Baltimore will be at 1:00 p.m. ET. CBS will have the broadcast. Jacksonville will have a favorable road matchup in Week 3. The Jaguars will travel to the Meadowlands to face the lowly New York Jets. Kickoff from MetLife Stadium in East Rutherford will be at 1:00 p.m. ET. CBS will have the broadcast.